Please fill out the form below to learn about our monthly specials! Get Started on Your Perfect Wedding Invitations! Looking for lively spring colors and popular designs? Not necessarily. As soon-to-be-wedded couples will find out, choosing groomsmen dress options isn’t always so black and white (pun intended). The groomsmen dress options will vary based on the theme of the wedding, how formal the ceremony is, and the unique style tastes of the couple. 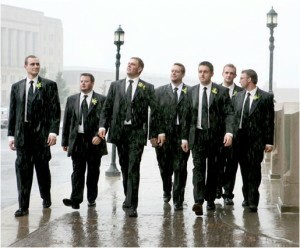 Ready to discover how to decide on groomsmen dress options? Grab a cup of coffee, sit back, and get ready to learn how to make your groomsmen shine! Like with wedding dress shopping, you’ll want to set aside a budget that your groomsmen can stick to when shopping for tuxedos. If there’s a particular designer style you have your heart set on, you’ll want to contribute money to your groomsmen, particularly if this style may be out of reach for their budgets. Assess your wedding budget to see how much you can contribute. The Notch Lapel: This suit jacket is squared off to the top collar, which creates a notched appearance. The Peak Lapel: This suit jacket is a double-breasted style that’s been imported straight from the shores of England. It’s one of the most traditional tuxedo looks, so this should be common enough to find. The Shawl Lapel: This tuxedo cut creates a continuous curve that resembles the traditional smoking jacket. The Fashion Lapel: This tuxedo cut utilizes two flaps of cloth to create a double-breasted appearance. The fashion lapel is perhaps the most formal of all four of these lapel options. Like with bridesmaid dresses, you’ll want to pick a groomsmen tuxedo color that perfectly complements your wedding colors. For many couples, this will be the traditional black tuxedo. Many couples also opt for white tuxes, which is common at more formal ceremonies. Playful couples may opt for colorful tuxes that incorporate the wedding theme, like navy blue or chocolate brown. No matter what you decide on for your groomsmen dress options, we’re sure they’ll all look dashing and handsome on your big day! Don’t forget to ‘like’ us on Facebook to get up to FREE return address printing! This deal ends October 31, 2012, so don’t miss out on this amazing offer! Join our list to receive special offers and new product announcements via email. See the different papers we offer with these samples. Order a paper sample kit today. Helpful verses and etiquette guidelines for your wedding. © Copyright 2014 Perfectly Invited. All Rights Reserved.